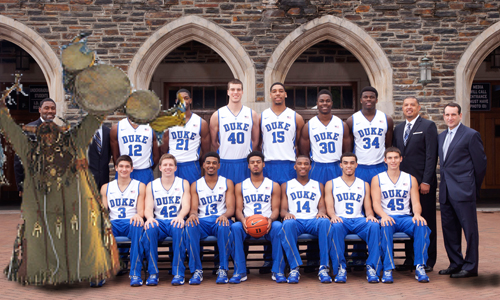 DURHAM, NC—As the Duke men’s basketball team readies itself to host North Carolina tonight, the team’s Shaman, the Footman of Satan, is preparing to do battle against the angelic spirit of Dean Smith, which Duke’s coach Mike Krzyzewski fears will tilt the odds in North Carolina’s favor. As Duke’s shaman poured a mixture of goat’s blood and human ashes around Cameron Indoor Stadium, he explained that a variety of spells and enchantments would be performed to repel any angelic host which might seek to aid the Tar Heels. “Dean Smith is surely among the highest orders of seraphim. If his spirit guides the hearts and hands of Carolina Basketball, they will triumph. I have filled wild pigs with the spirits of fallen angels and animated the campus’ gargoyles to patrol the land and sky, to wage unholy war against the forces of good,” he said.